The kitchen is such a busy place for sumptuous food making for the family, and something mobile and efficient would be much appreciated. Mobility and efficiency could be the words that best describe this kitchen rolling table. Find out how to make one of your own and add this to your list of cool DIY projects. 1. Cut the legs to size. Cut the legs according to the size you would want for your project. This project is 85cm tall and has 58×50 cm tabletop. Use whatever saw you are comfortable with, but the project uses a hand saw and a miter box. Mark where the pieces will be joined together. Drill for the holes. Use dowel pointers to find the right spot for the opposite holes. Apply wood glue and put sticks that will connect two parts of the project. After assembling, clamp them down. This is the first two sides of the base. Use the same technique in forming the other sides, creating the four – sided base of this kitchen table. Use block plane for the sides of the wood. Glue the pieces together to create the top and clamp them together. Put some weights to make the top as flat as possible. Leave it to dry. 4. Cut the top piece. Glue two boards together in a 90 – degree angle. 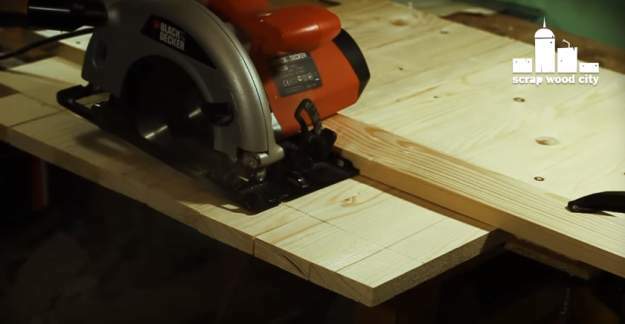 With a circular saw, establish the starting point of the cuts on the shorter board. Now cut off the excess length using the circular saw. Round over the top by using a router and a round over bit. 5. Make the bottom shelf. Glue and nail the pieces of the secondary shelf, just below the top piece. Have even spacing. Round over the edges using a block plane. 6. Assemble the kitchen table. To do this, use a flexible drill extension and metal angles. This is in order to reach and screw the awkward areas of the piece. Screw the pieces and sides together. Create the secondary shelf just like the bottom portion. Sand the whole table to rid of rough edges. Plane the lower shelves to round its edges. Apply a water – based varnish on the table. Sand it, and apply once more. Screw the wheels into place. Now you have a complete kitchen rolling table! Now you have a kitchen rolling table. Not only will it make your kitchen tasks convenient but also it is an awesome addition to your kitchen furniture. Click Here For More DIY Projects For Your Kitchen!